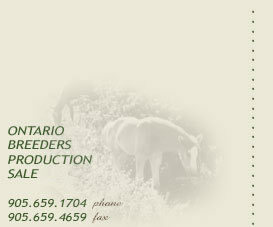 Why choose a crossbred horse? Our horses are bred to combine the best qualities of the Clydesdale, the Thoroughbred, and the Hackney to produce an athletic, versatile horse with an uncomplicated disposition. Why the Clydesdale? First and foremost, we use the Clydesdale in our breeding program for its size and its wonderful temperament. With its good sloping shoulders and long legs, the Clydesdale is noted for its free movement and ground covering stride. The Clydesdale also has a long well-arched neck with a short compact body and powerful hind quarters. All of these qualities contribute to making it the most athletic of all draft horses. Why the Thoroughbred? The Thoroughbred has played an important role in establishing many of today�s prominent breeds, such as the Hanoverian and the Dutch Warm blood. The Thoroughbred contributes strength, courage, and elasticity, while also adding a refined conformation and elegant head and neck. The Thoroughbred�s deep girth allows for a large heart and great lung capacity which proves to be valuable for stamina and endurance. With its many great qualities, the Thoroughbred is still one of the most competitive horses in equine sports (i.e. racing and show jumping). Why the Hackney? The Hackney has a strong, compact body with great depth of chest. This provides them with exceptional self carriage and the natural ability to elevate their shoulders and collect on their haunches. The Hackney horse was bred for endurance and is capable of �going the distance�, which proves to be a valuable asset in a wide range of sports. Although the Hackney is most well known for its elegant high stepping movement in harness, it is interesting to note that the world high jump record of 8�2� is held by a Hackney cross bred. The combination of these breeds gives you a great value of courage, soundness and endurance while producing a horse which is refined and athletic, yet sound of mind. Whether its field hunting, dressage, eventing, show jumping, driving or even pleasure riding, the cross bred horse proves to be exceptionally competitive. These horses are appropriate mounts for just about any equestrian sport and are easily trained by amateurs and professionals alike.